Historically, three-year rolling returns have revealed consistent outperformance from the S&P 500® Dividend Aristocrats® Index, which is composed of quality companies with at least 25 consecutive years of dividend growth. Why look at rolling returns? Rolling returns offer a more robust way to show performance than traditional one-, three-, five- and ten-year trailing returns. Rolling returns present numerous overlapping (rolling) increments, versus fixed trailing calendar periods that only let you see points in time. Since investors rarely buy and sell strictly by a calendar, rolling returns may help investors better assess historical performance. 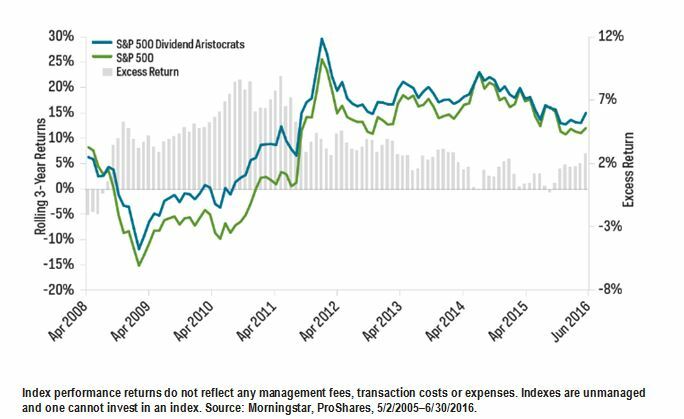 The Dividend Aristocrats outperformed during 95% of rolling periods from May 2, 2005–June 30, 2016. The Dividend Aristocrats had lower relative volatility than the S&P 500 92% of the time. And the Dividend Aristocrats produced excess returns over the S&P 500 during the financial crisis of 2008, in the subsequent rally and during the majority of the periods since then. The S&P 500 Dividend Aristocrats Index invests in a select group of high-quality companies within the S&P 500—those that have grown their dividends for at least 25 consecutive years. The Dividend Aristocrats currently includes 50 well-known companies, over half of which have grown their dividends for an impressive 40 years or more. Since its inception in 2005, this index has had an impressive track record of outperforming the broader S&P 500—with lower volatility—under a variety of market conditions. The index’s three-year rolling returns reveal the consistency of the index’s risk-adjusted return. This information is not meant to be investment advice. There is no guarantee dividends will be paid. Companies may reduce or eliminate dividends at any time, and those that do will be dropped from the indexes at reconstitution. Past performance does not guarantee future results.